I love any chance I have to get out to SingleCut Beersmiths, which is usually reserved for the weekends. Digging their live music, and the laid back communal vibe, it's never a hard sell to get a group out to enjoy it. While they usually have a pretty limited food offering, consisting mostly of snacks such as giant warm pretzels or savory meat pies, I was excited to learn that they're offering something new this week. Oysters! A nice combination with their hoppy ales, oysters will be making a debut on their menu this coming Wednesday, September 25th as well as this Sunday, September 29th. They're calling it their Oyster Party, which starts at 6 p.m. on Wednesday at at 1 p.m. on Sunday. Wednesday's celebration is extra personal, as you can bring in a record of your choice and they'll play all your faves right on the spot. 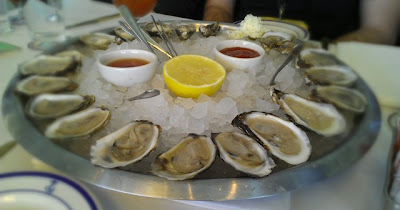 The oysters are supplied by Crudo Sea and Land, which is a travelling oyster and raw bar. Neat idea! Let me know how you like it.